It's our first inkling that Lent is near, one week away from the Triodion, four weeks away from Lent. I think Zacchaeus is one of my favorite characters in the entire Bible, because, like the Publican, which he was, the Publican whom we'll read about next week, he knows the life he has led. So when he encounters Jesus, he tells him, "Half of my goods I give to the poor, and, if I have defrauded anyone, I am restoring it four-fold." He knows that he's done some things that he shouldn't have done, that he's taken more than he was supposed to, that he has defrauded people, and he even knows who those people are. I find that amazing: the fact that he has that presence of mind, that knowledge about himself, to be able to say: Yes, I know I've defrauded people, I know who those people are, and I am going to do everything I can to make it right with them, that being part of our being made right with God. Our Old Testament professor in seminary often talked about the two dimensions of the cross, that there is a vertical dimension, where we have our relationship with God, but there is also a horizontal aspect to the cross, and that we cannot really be made right with God if we do not, as much as is in our power—we were talking about that in our religious education class this week—as much as is in our power, if we don't try to make it right with one another. That's why we ask for forgiveness before receiving Communion and why there are admonitory verses in the service of preparation that say, "Before receiving the Blood in Communion, make peace with those you have offended." Here Zacchaeus encounters Christ, and he is struck by the fact that he is not right with God, but he has this realization, first of the knowledge of the things that he has done. And this reminds me of the old Greek saying, that the unexamined life is not worth living. Obviously, at least at that point, Zacchaeus was able to examine his life, to know what he had done wrong and to try and set things right. So he encounters God, he realizes he is not right, and he realizes that part of making his life right with God meant making things right with those whom he had defrauded, those he had wronged. 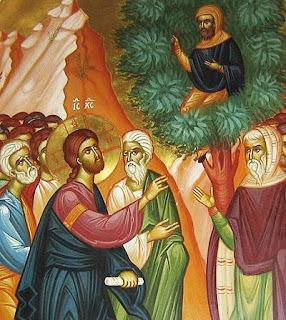 So we are coming to Lent, and I know I talk about this often, but the things that Zacchaeus did are set before us as an example, as are many of the things that are in there - as I was talking to the little ones, St. Paul was talking to St. Timothy, but he's talking to us. We have the story of Zacchaeus and his example of how to repent, and that is an example for us as well. Of course, I'm mentioning this because, yes, we are coming to Lent, which is traditionally the par excellence time when we partake of the sacrament of confession, but that requires us to know what we have done in our lives, to be honest with our shortcomings so that we may bring those to Christ, that we may be not just forgiven but also healed of the things which are not of the according to the will of God. And, just as Zacchaeus did and as we are admonished to do in the service of preparation for holy Communion, we don't just come to the sacrament of confession, but we try as much as is in our power to make right the things we have done wrong, to apologize to those whom we've wronged, if we have fallen like Zacchaeus and taken more than was our share, or whatever it may be. We are four weeks away from the start of Lent, and it's a time of preparation. In order to come to Pascha, to the Great Feast, prepared, able to receive the joy and the light in its fullness, I think it's good to start preparing now, to think: When Lent comes, what do I need to set right—with God and with those around me? Let us take the time to start thinking about that now, so that when Lent comes we may be prepared ultimately, through the sacrament of confession and all those things that repair the relationship that we have with God and with one another. So Zacchaeus is one of my favorite characters, favorite people in the Bible. I shouldn't say "character," because he's not a fictitious character, but he is someone who turns his life around and turns his life to Christ, and that changed how he interacted with those around him as well. May God give us the grace, the wisdom, the strength, to face ourselves and to right the things we have done wrong and to come before Him in the sacrament of confession, to be forgiven and healed of our sins and of our passions, so that we may indeed be lightened, be burden-free, be bright with the light of the grace of God and so, always with peace and joy, give glory to the Father and the Son and the Holy Spirit.